Windows 10 Fall Creator's Update has a special feature which will let you use your keyboard as an additional mouse. This special feature is extremely useful in the case when the laptop's touchpad gets failed or your USB mouse stops working suddenly. In this case if your desktop PC or laptop is running Windows 10 version 1709 or above then you can use the keyboard's numpad as a mouse. Do remember that Microsoft is still giving free upgrade to Windows 10 in 2018 to Windows 7/8 users. Grab your free copy now because the offer can be withdrawn anytime. Go to 'Settings>Ease of Access>Mouse'. Under 'Mouse keys' enable 'Use numeric keypad to move mouse around the screen'. Also enable 'Hold down Ctrl to speed up and Shift to slow down' and 'Use mouse keys when Num Lock is on'. You can use Ctrl key to speed up the mouse pointer or Shift key to slowly move the mouse pointer around the screen. If you enable the Num lock option then the Num keys will only move the pointer when the Num lock is ON. Use Num key 8 to move up, 2 to move down, 6 to move right, and 4 to move the mouse pointer to left. Use Num key 5 as left click and the plus '+' key as right click. Complete configuration is given below. Use the arrow keys to scroll on a webpage. This features becomes useful when the USB mouse of your desktop computer fails to operate or the laptop's touchpad doesn't respond. 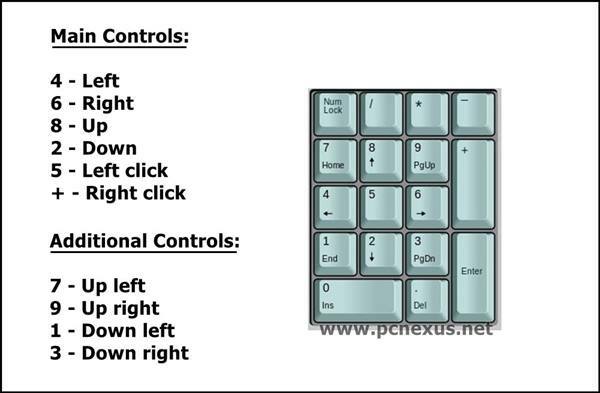 We can use the Ctrl and Shift key along with the main control keys to speed up or slow down the pointer movement around the screen. So it is quite a good feature that you can use when your mouse don't work or you actually don't have it around.